The time-saving TURBOSHEAR Model No. TS1 inserts directly into the chuck of a standard 1200 rpm A/C or cordless drill. It’s that easy to convert your power drill to a power shear! This rugged but inexpensive accessory cuts straight and to the left and is capable of navigating tight curved patterns and squares in heavy 20-gauge (1.02 mm) galvanized steel. Blind cuts require only a 1/2”(12.7 mm) starting hole. Cutting applications include both ferrous and non-ferrous sheet metals, metal roofing/building panels, vinyl, steel mesh, ductwork, even the thick metal of furnace jackets, equipment enclosures or automotive body panels. An offset design keeps both hands away from work surface. Long-wearing hardened jaws are also replaceable. For premium performance without the premium price of a dedicated power shear, TURBOSHEAR is an easy addition to every tool bag. 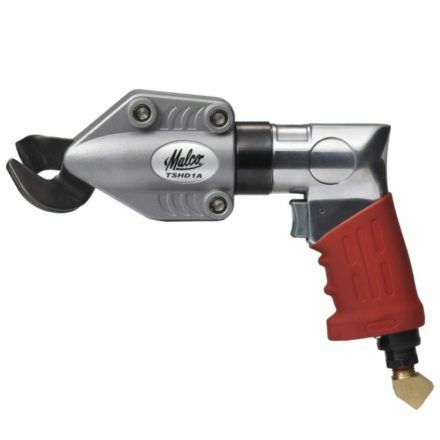 Inserts into chuck of A/C or cordless drill. Navigates tight patterns and square cuts. Cuts a variety of building materials. 20 gauge capacity in galvanized steel. What materials will the turbo shear cut? The TS1 cuts 20-gauge (1.02 mm) galvanized steel (HVAC duct work, auto body panels), 24-gauge (.63 mm) non hardened carbon steel and stainless steel (metal roofing panels), 16-gauge (1.2 mm) aluminum (trim coil, flashing), and .050 inch (1.27 mm) copper (metal roofing, gutters). How clean is the cut? TS1, Turboshear metal cutting series will make clean cuts throughout the range of thicknesses of material listed above. The tool will need to be adjusted when going from very thin to thick material and vice versa. How do you adjust the tool to get the optimum cut? TS1 – The clearance between the cutting jaws is adjustable in order to achieve the optimum cut for thick or thin material. To adjust, locate the 3/16” set screw on the back of the tool, towards the front of the tool near the jaws. Turn it clockwise to tighten the gap of the jaws for thinner material or counterclockwise to make the gap of the jaws larger for thicker material. Use them every day as an HVAC Technician so I can say without question that this turbo shear lives up to every bit of what I have come to expect from Malco. Great piece of equipment for anyone working with sheet metal or in the HVAC field. Robert C. Cale "Bob the Farmer"
Cuts through sheet metal like through butter. This is a winner, cuts through sheet metal like through butter, highly recommended. Must have for metal working novices/experts! This is a very interesting tool! It works very well and is so simple to use. I used it to cut metal sheeting while roofing my garage and house. I made 20' cuts in a matter of seconds (about a minute). I could also easily cut across the ridges and make circular cut outs with ease. Very impressive!!! A must have if you're working with any sheet metal or similar items. This was my first attempt at metal roofing and this tool really made it less difficult. Highly recommended!! It makes your life easy. I love it! For the price, it's really very good and does what is expected. I bought this to aid me in cutting up carpet for removal, but it's far easier, faster, and cheaper to use a utility knife or razor blade. It's well made, though, and for cutting thin metal would probably be ideal. It appears well made, tight tolerances and all that jazz. Definitely not your usual made in china feel if you know what I mean. It works as advertised and expected, but it's not the tool I'd hoped to "snip" out steel framing studs. The mouth of this doesn't open quite enough to get a grip on those without manhandling everything. It doesn't claim to do that and it does very easily go through your typical sheet metal roofing shingle, etc. After I use it more I may edit the rating from 4 to 5 if it is super smooth after prolonged use, or if it degrades quickly down to 3, otherwise it is a good piece of kit, worth every penny, but not better than I'd hoped. About the coolest tool for the money I've bought in a long time. Works really well for cutting RFP! Using this to cut the metal back splash panels in our kitchen has saved quite a bit of time during install. I do caution you to be careful. The slightest tilt of the drill and you'll end up with a ruffled edge. Experiment and get comfortable with it before you cut something you care about. Worked great and cut through metal like butter! Used it on corrugated sheet metal to make raised garden beds.